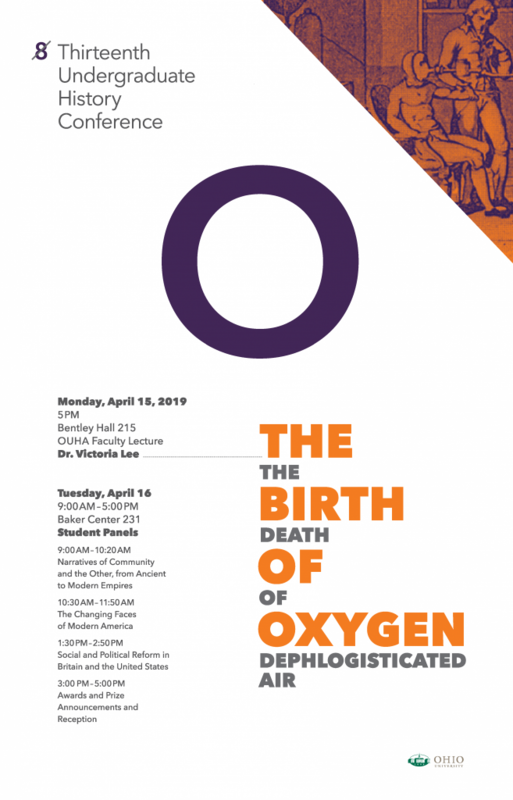 The Ohio University History Department invited the Ohio University and broader Athens community to the 13th Annual Undergraduate History Conference on Monday and Tuesday, April 15-16, 2019. Three panels of student presentations are scheduled for Tuesday, April 16, from 9:00 a.m. to 2:50 p.m., in Baker Center 231. The conference will conclude with a 3:00 p.m. awards ceremony, announcing this year’s inductees into the Phi Alpha Theta honor society as well as the 2019 winners of the Randolph Stone Historical Writing Contest and a variety of departmental scholarships and fellowships. The History Department invites all members of the university community to come learn with them and support students in this initial foray into the historian’s profession.